Like a sentence by Dr. Suess, the presidential polls seem to be up, down, all around and potentially nonsensical. As the election nears, the frenzied polling only increases each day. The famous Gallup Organization updates its presidential prognostications numerous times daily. How is the average non-statistician to make sense of them? The Internet has been a boon for pollsters  everybody's results are touted worldwide seemingly instantaneously. But for observers it sometimes leads to confusion. How can the AP be calling the race as near dead even, when CNN has Obama with a significant lead at the same time? Well, poll experts say that it has little to do with strict numbers and everything to do with who you ask...and what you ask them. The same pollsters publish very different numbers for samples of registered and "likely" voters (those who have voted regularly in the past.) But it's even more complex. For example, some polling organizations use cell phone numbers in their samples, some don't. Cell phone users tend to be younger and more affluent  factors that also play into voting patterns. The Internet is a great place to sort these discrepancies out though poll aggregators  sites which gather the disparate polls and re-calculate all the results offering up some sort of believable average. The serious analysts don't just add and divide, but weight different pollsters based on past accuracy and other factors. However, the aggregators often don't agree among themselves. There's been a blog-based battle between two of the most popular sites, RealClearPolitics.com and FiveThirtyEight.com over which polls should be in, or out, of the sample. Then last week there were the numerous articles about American racial attitudes and "The Bradley Effect"  which suggests that predicting whether people are telling the truth to either themselves or pollster is always a losing game. Our best advice is self-education  read the tips below and read the each site's FAQ. The National Council on Public Polls has a list of questions all journalists should ask before citing a poll. They are useful questions for a media-savvy public as well. What area (nation, state, or region) or what group (teachers, lawyers, Democratic voters, etc.) were these people chosen from? Are the results based on the answers of all the people interviewed? Who should have been interviewed and was not? When was the poll done? What is the sampling error for the poll results? What other kinds of factors can skew poll results? What questions were asked? These questions are annotated at the National Council on Public Polls web site. You can also find an Ethics and Standards guide to polling at the American Association for Public Opinion Research. You can often obtain the full poll from the polling institution. Bill Moyers interviewed Daniel Yankelovich, founder of the non-profit organization Public Agenda and author of THE MAGIC OF DIALOGUE in 2004. Recognized the world over for careful and credible research on American values and public opinion, Yankelovich explains the need to be careful when reading poll results. Best Estimates: A Guide to Sample Size and Margin of Error There are about 209 million adults in America, of every imaginable background and circumstance. So how can a survey of only 800 or 1,000 adults reflect what the entire country is thinking? Public Agenda crunches the numbers. The American Association for Public Opinion Research (AAPOR) is the leading professional organization of public opinion and survey research professionals in the U.S.
Real Clear Politics keeps track of and aggregates hundred of state and national polls and allows the viewer to sort by pollster, state and date. PBS and NPR use Real Clear Politics data in some of their electoral maps. This site is the work of baseball statistician Nate Silver, who updates his own take on the polls several times daily. Silver. 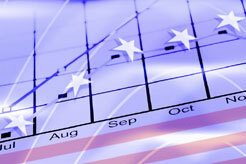 The site has an extensive FAQ on the methods used to weight each pollster's accuracy. This aggregator has a group of six bloggers who comment on poll trends. The BBC offers a frequently-updated interactive feature following four key pollsters over time. The famed pollster offers frequent updates on the premiere polls on its homepage. You can dig deeper for their analysis of the economy, election issues and even the view from overseas. Quinnipiac College offers good basic lessons in poll design and interpretation.